The first phase of the Tema port expansion project by Meridian Ports Services is expected to be operational by end of June this year. So far about 80 per cent of work has been done on the initial phase. According to the Chief Executive Officer of Meridian Ports Services, Mohamed Samara, when completed, the Tema port will be the biggest in the Sub-Saharan region. 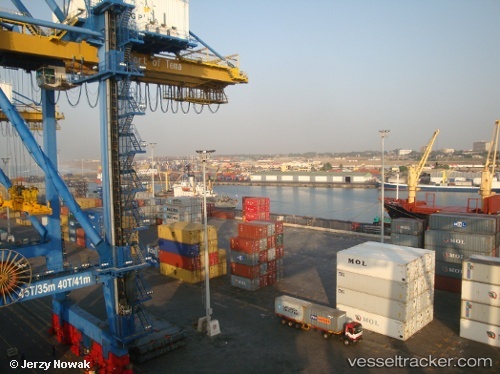 Started in 2007, the Tema port expansion project is a joint venture between the Ghana Ports and Harbour Authority (GPHA) and the meridian ports holding. The Meridian Ports and Services Limited (MPS) on February 1, 2019, received the second batch of gantry cranes ordered for the Tema Port Expansion project. The delivery follows the purchase agreement signed in August 2017 between Shanghai Shenhua Heavy Industry Co. (ZPMC) and MPS led by Mr Kweku Ofori Asiamah, Minister of Transport, for the total of 27 gantry cranes; seven Ship-To-Shore gantry cranes (STS) on the water front and 20 electric Rubber Tyre Gantry cranes (eRTG) in the yard. The STS cranes are Super Post Panamax with 65 meter outreach capable of handling containers on board vessels up to 23 rows and 10 on deck while the eRTGs are capable of stacking containers seven wide and one over five high in the container yards. The Ghana Ports and Harbours Authority (GPHA) is putting in stringent security measures to close all avenues used by persons who want to use the country’s sea ports to stowaway to Western countries. Security operatives at the Tema Port say stowaway is the major challenge faced by the GPHA as ‘one or two’ persons have been caught engaging in it this year. Mr Stevens Siaka-Anane, Deputy Harbour Master in-charge of operations, disclosed this on Thursday during the Second Chartered Institute of Logistics and Transport-Ghana (CILT) Continuous Professional Development Programme at Tema.